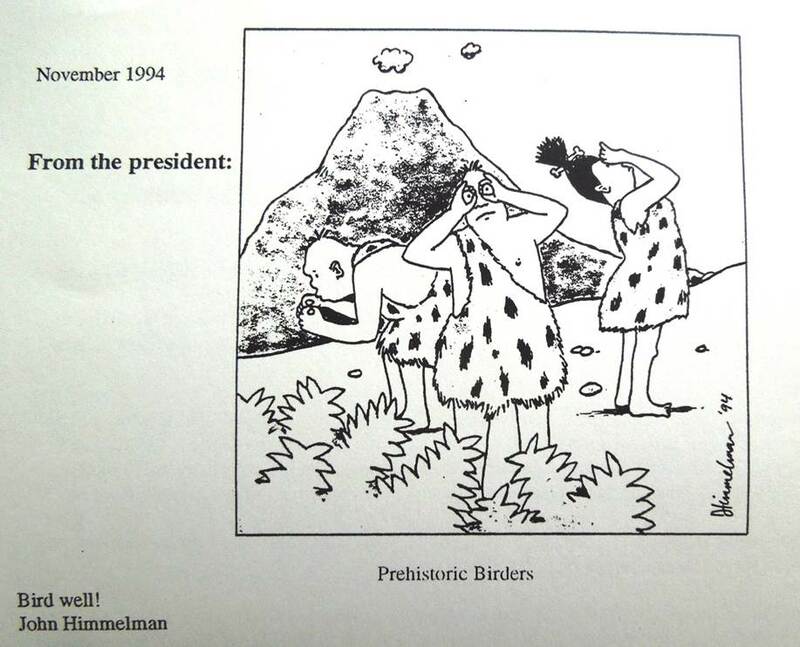 I just came across a cartoon I did back 1994 – when I was president of the New Haven Bird Club. Part of the job was writing a “From the president” piece for our newsletter. I couldn’t think of anything to write that month, so I drew a picture. The blood-red eye of a vireo. Oh the horror... OH THE HORROR! Sixteen birders braved the (level, mostly paved) trails and (bit chilly) climate on a birding expedition into the most savage, untamed (lawns weren’t mowed yet) wilderness on that particular spot on the map. The rather modest total of 38 species was but scant reflection of the august efforts of the stalwart lot choosing to throw caution to the wind on that dark (overcast) Sunday morning. Walking across a winding platform of mere lumber (the boardwalk), only inches above the roiling waters, we espied, at eye level, warbling Warbling Vireos and yellow Yellow Warblers. A Song Sparrow caroled, perched on an alder — typically a common sight, but this one sang a chilling version of its song none there had heard before. It was shortened; cut in half. Despite this, we moved on. Curiously shrunken mockingbirds flitted like butterflies above our heads. These tiny “blue-gray” aberrations were surprisingly adept at “gnat-catching”, despite having to overcome the asthmatic wheezing this activity seemed to bring on. Two American Redstarts were seen and heard. Pine Warblers were not. Could there be a connection? Of course not. A Worm-eating Warbler was discovered along a stream. However, on this morning, and in this place, one could be forgiven for expecting to see worms eating warblers. Louisiana Waterthrushes called, and yet, none were seen. How could this be? One ray of sunshine was a Yellow-throated Vireo, who, like its Warbling cousins, chose to sing for us in the open, at eye level. It gave our loins the much needed girding for pushing forward. With necks craned at torturous, inhuman angles, we watched singing Baltimore Orioles and Northern Parulas. A lone vireo, its eyes blood-red, murmured to itself in short, repeated phrases. It was stuck in a vocal loop, oblivious to our presence. The bird was beyond anyone’s help. Along a stream, a pair of Gray Catbirds tossed leaves angrily into the air. They may have been looking for food, but on this day, who could say? Hunger drove a normally sane Downy Woodpecker to hammer its bill, repeatedly, into an old black birch. White-breasted Nuthatches ran up and down the trunks of trees, scoffing gravity, and who knows what other laws of nature? That compelling force — hunger, undoubtedly pushed a Broad-winged Hawk into the air, where it whistled like a killdeer. An osprey circled over the pines. Was it looking for fish? Was it compelled by past success in finding fish in the upper canopy of the conifers? On any other day, in any other place, I would not have even entertained such thoughts. Sixteen people entered. Fourteen returned. Dean and Maryanne Rupp had succumbed to the whispered invitations of a path off the main trail. I could see in Maryanne’s eyes there would be no convincing them to leave the park. That was twenty-three hours ago. I have not seen them since.